Taken at Farmoor, Oxon., on April 28th 2018. The House Martin is a small bird with glossy blue-black upper parts and pure white under parts. It has a distinctive white rump with a forked tail and white feathers covering its legs and toes. It is widely distributed in Europe, but is a summer visitor, arriving in April and leaving in October. It winters in Africa. 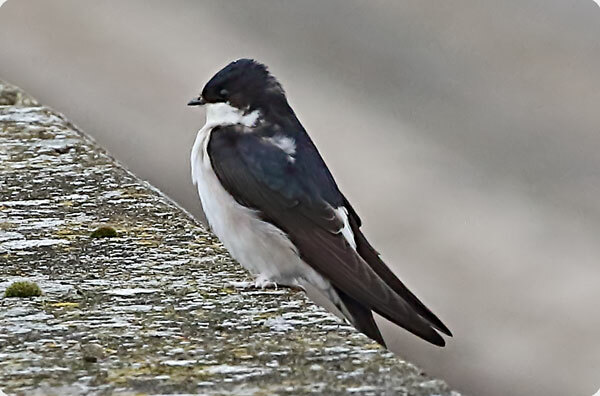 House Martins are colonial breeders, making their mud nests on buildings, or cliff faces in undeveloped areas. They spend much of their time on the wing collecting insect prey. The House Martin has Amber status in the UK due to moderate population decline. Upwards of half a million pairs breed in the UK.